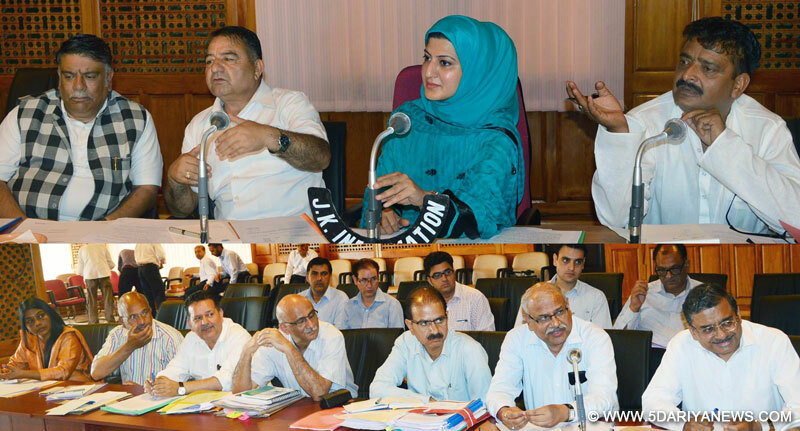 A meeting of the Assurance Committee of Legislative Council was today held here under the chairmanship of MLC, Dr Shanaz Ganai to discuss issues related to the Forest Department.The other members including MLC Mr. Khursheed Aalam, Mr. Sofi Mohammad Yousuf and Ghulam Nabi Monga also attended the meeting.The Committee reviewed the extent of implementation of the assurances given by Ministers from time to time on the floor of the Council with respect to the forest department.Commissioner Secretary Forests, PCCF, J&K, CCF Srinagar/Jammu, Chief Wild Life Warden, MD J&K SFC, Director Social Forestry and other senior officers of Forest department attended the meeting. Dr Shehnaz Ganai holds Women’s Convention, Launches fight for rights campaign. Dr Shehnaz visits the flood affected areas along LOC, demands compensation.